It's one week until Halloween. Do you have a pumpkin pattern yet? If not, don't worry. The Internet has you covered. There are patterns out there for just about any geeky fandom if you look hard enough. And to make your life even easier, I've compiled some of the best ones for you. You can create gorgeous, topical, geeky pumpkins using patterns or templates. Simply tape the pattern to your hollowed-out pumpkin, poke holes along the line of your pattern, then cut out the holes. Insert the candle, and magic will happen. 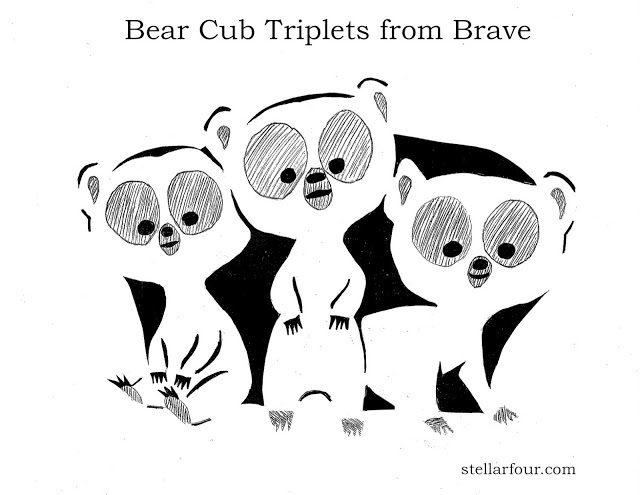 First, some self-promotion: Click here for S4's exclusive (and frighteningly adorable!) 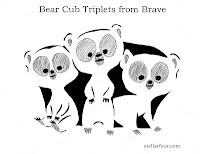 carving pattern of the bear cub triplets from Pixar's summer hit Brave. Examples from the Zombie Pumpkins website. Zombie Pumpkins always has a good selection of templates you can download. They've got classic movie monsters (Freddy Krueger, Chuckie, The Joker, Jason Vorhees, etc. ), popular film heroes (The Avengers, Captian Jack Sparrow, Bella Swan — if nothing else, you can make and smash her — Chewbacca, etc. ), television terrors (Dracula Mr. Burns!) and video game figures, plus a whole section of Tim Burton characters (I'd go with Beetlejuice, but you've got tons of other options, too). Also, Cthulu. This website does charge for its downloads, but it's fairly cheap, particularly if you go in with a few other people and download several patterns for you all to use. Ultimate Pumpkin Stencils has a set of Game of Thrones house sigils. Imagine the Stark direwolf and the Lannister lion battling it out on your front porch! They've also got a collection of Disney and Muppet stencils (naturally, I'm pining for Miss Piggy), and the best Bane stencil I've seen this year. These are a little pricier, but they'd all look great aglow on Halloween night. If you're in a Doctor Who mood, arteclair on deviantART has a fantastic pair of Weeping Angels that would look great flanking your doorway. Here's a different kind of geeky: Get your political nerdiness on with these patterns from the Pumpkin Lady, featuring George Washington, Thomas Jefferson, the Liberty Bell and more. There's a charge for these patterns. Examples from Pumpkin Jack Carving. Pumpkin Jack Carving has amazing patterns for advanced carvers interested in trying out shading techniques. Here you'll find patterns for characters from Doctor Who, Buffy, and the Avengers, plus tons of classic villains (Darth Vadar! Pennywise the clown! Sigmund Freud!) and, weirdly, iCarly, plus many more. This website is probably also the only place you'll find a pattern for Isaac Asimov's face. Be warned that these will take time and patience to execute. Another challenging group of patterns is available at Fantasy Pumpkins. The dragons are gorgeous, but I have so far not worked up the courage to attempt them. Star Trek fans: There's also a pattern for the Enterprise. Haven't found anything you like? Buy tools. The cheap orange plastic tools they sell at your local megamart will be fine for your precision cuts. If you get serious about carving, invest in a nice wood and metal set. When you transfer the pattern onto your pumpkin by poking holes through it, smear a thin layer of baking flour across the pumpkin surface to help you see all of the tiny dots. It'll wash right off when you're done. If you carve an amazing pumpkin this year, please share it with us on our Facebook page, or tweet us a pic. We want to see how you celebrate Halloween! 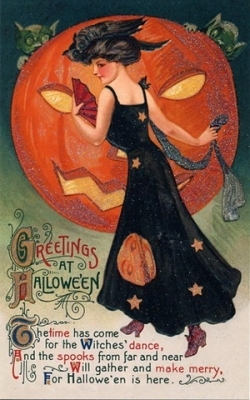 Depending on your taste, you can select any of the amazing Halloween pumpkin design to make this Halloween the best eve. we wrote article is about, “Easy Pumpkin Carving Ideas 2018” that will make this Halloween more beautiful and joyful for you.